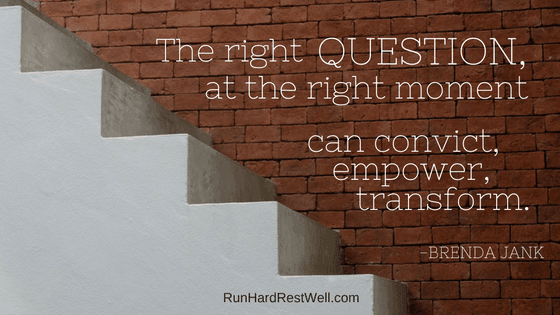 THE Leadership Question • Run Hard. Rest Well. The right question, at the right moment can convict, empower, transform. The opening question from a recent blog post of Dave Kraft made a beeline for my heart. Run Hard. Rest Well. is experiencing a tremendous rate of growth. At times it leaves me feeling scattered. Pulled in many directions, internal chaos mounts. Wheels spin. Productivity declines. It doesn’t matter if you’re a mom or a CEO, it’s not a place we want to stall. Dave’s post was a gift to me today. I pray it is a gift to you, as well. We share it now with his permission. What are the most important things I should be working on . . .
Not what is . . . But what is . . . The Most Important Thing? Learn more about Dave’s ministry. Hi John – Glad you found this post as big a blessing as it was to me. You sure can post. Thank you!! (Dave Kraft’s site will still be shared, too, I assume.) Blessings! Darcy — I had the same reaction. This article was such a gift . . . and now a focused matter of prayer. Asking God to help me surrender my To Do Lists to him in a whole new way. We share the same heart’s desire. I love this post. Should be required reading for anyone experiencing stress—hits the nail right on the head!! I think so, too! Blessed me so much. Brenda, thank you. Of course I’m late. I’m overwhelmed. Not even 5 minutes ago I determine to cancel my Facebook account as of Friday. Why? It is distracting me, making demands on my time that are often frivolous…Comments on games, silly and cute things, prayer requests, scary things….you get the idea. The thing that hurts the most is that I love everyone of my Facebook friends and I want to be involved in each life, but I must be effective in the things that are most important. How do people do all this with Facebook anyway? Maybe they aren’t as OCD as I am. LOL. You know my heart…..it Jesus. HE and He alone is my God….the Trinity…..I choose my Abba. Betty — Wow. Courageous Act. Not easy. May this new season be infinitely blessed! You bless us all, Betty! You well know, Brenda, that diamonds are produced by heat and pressure. One the other side we will see what has been produced. For now we trust and hope. Love all y’all, my friend.